Right before your eyes, your baby has turned into a big three-year-old with his very own personality, interests, ideas, and thoughts. At this developmental stage, your big kid is now developing more skills and a longer attention span. You are probably also experiencing his boundless energy! At three years old, your little one has likely shown interests in certain activities over others. It is a great time to introduce them to a variety of ways to play like make-believe, age-appropriate sports, music activities, art, and reading. Different toys can be a great way to help your child to discover his own passions. Learning while playing is a great way to help your little guy develop while having fun. We have created a go-to list for you with a variety of toys that incorporate everything from building, music, imaginary play, art, as well as a few that will help use up some of that endless energy in your little one. We hope that along the way, your three-year-old will grow in fine and gross motor skills while learning new things and discovering what he loves. Whether shopping for your son, nephew, or for a friend’s child, this is a comprehensive list of the best toys for three-year-old boys. 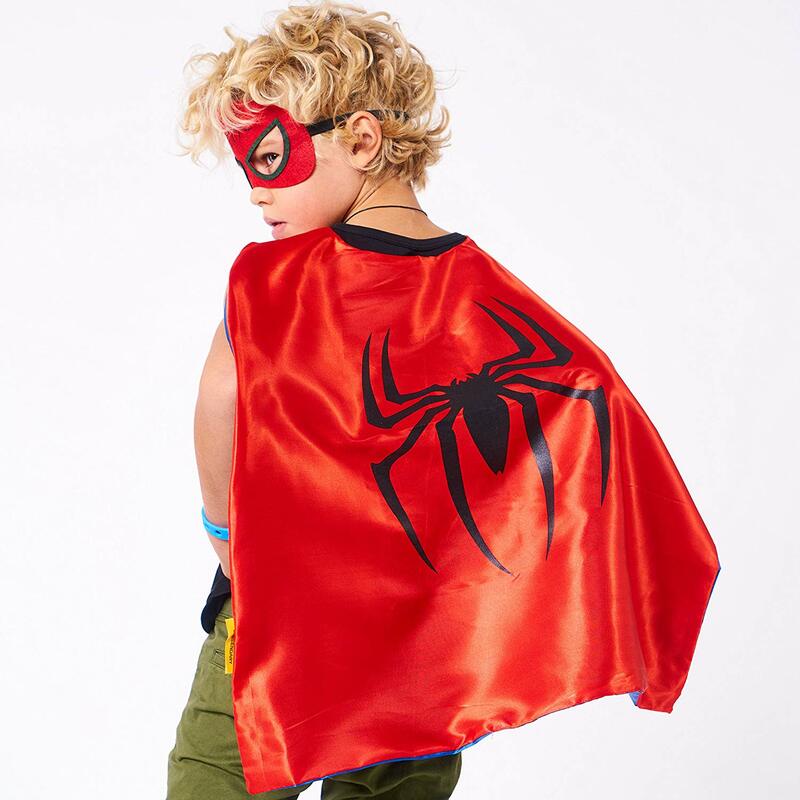 This set of costumes will allow your big kid to use his imagination as he becomes each superhero character. Your three-year-old is at the perfect age to enjoy dress-up play and pretend. Included with your purchase are four double-sided cartoon hero capes and eight felt masks that work great for kids from three to ten years old. Your boy will have hours of imaginative dress up and pretend play. These costumes would also be great fun at a birthday party. Your big three-year-old is going to love this push toy grass mower that makes noise with the included popping beads. He can pretend to safely do yard work alongside you and even stop to put in pretend gas with the removable gas can. To get started, your little guy can turn the clicking key and see the movable throttle. The engine sounds when he pulls the cord. All the sounds on the mower are mechanical and conveniently do not require changing any batteries. This toy will provide many summers of exciting pretend play. 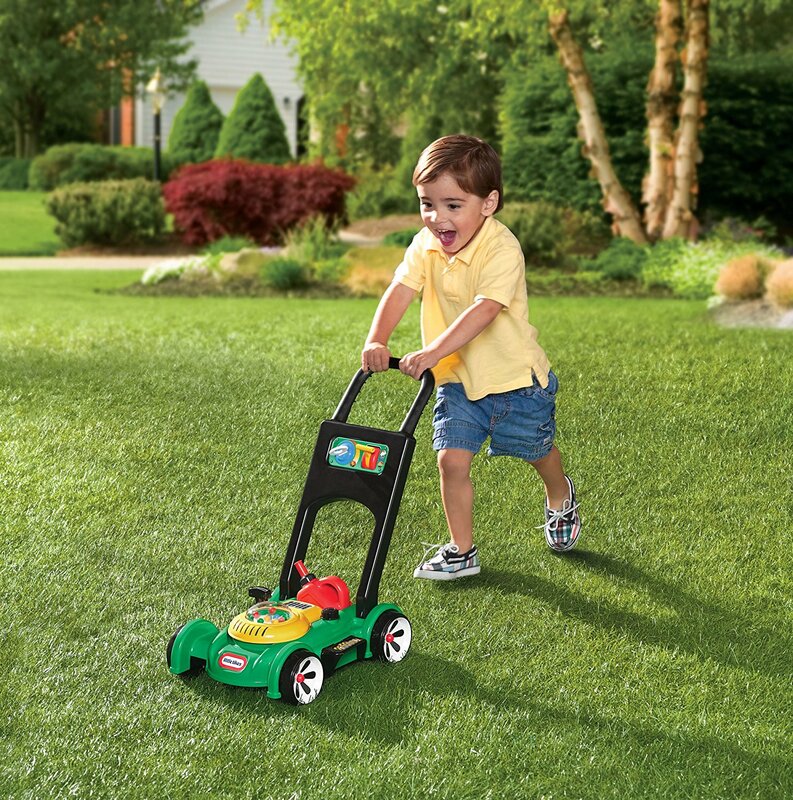 Lots of outside fun awaits your three-year-old with this fun Little Tikes Gas n’ Go Mower! All you need is a bit of water and the magic water drawing mat comes to life. It is a wonderfully safe and clean way to let your boy doodle just about anywhere. He can color and doodle with water on the magic water drawing mat that will not wet the floor or table. He can practice writing and his artwork with four different colors! The mat measures 31.4 X 23.6 inches. It is easily portable for travel and can be used indoors or outside. 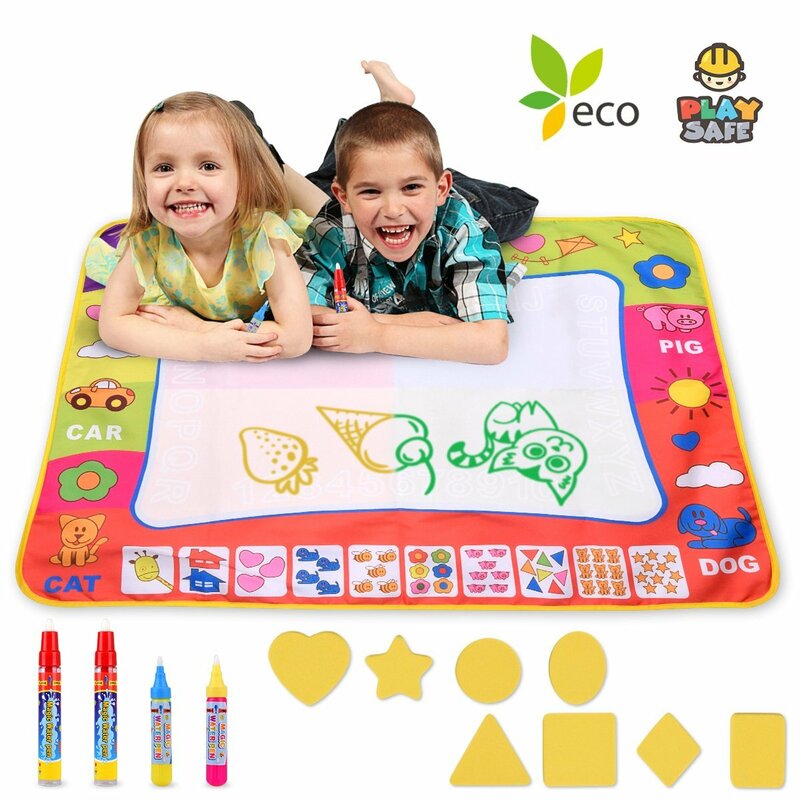 To use this mat, simply fill the pen with clean water and draw on the magic water drawing mat. Magically, the drawings will disappear after several minutes so that he can draw on the mat again and again. This gift comes with a great 100% quality warranty where if you are not satisfied with the magic doodle mat, you can simply ask for a full refund. With your purchase, you receive one water doodle mat, two large water drawing pens, two small water drawing pens, and eight drawing molds. This is a great learning and artist toy option. Almost every young boy loves small trucks and cars to play pretend. My son has little cars in almost every room of our house! 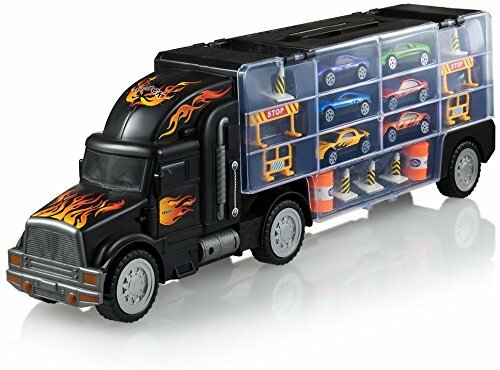 This car and truck carrier is a great way to organize and transport your son’s favorite toys. This gift includes six cool die-cast racing cars along with construction signs, construction cones, as well as and construction roadblocks. You can fit a total of twenty-eight cars or trucks in this carrier with fourteen storage car slots on each side. The carrier itself is great fun for your little guy. The top of the carrier also has a small handle so that it can be easily moved from one play area to another. This toy car carrier measures 20″ inches long x 7.2″ inches high x 3.5″ inches wide. It is a great gift idea for your three-year-old as he imagines driving all his fun, fast cars! This building set is great for play and learning. Your little guy will love these magnetic blocks long beyond his young years. He can learn colors and shapes while playing and building. You will likely see your three-year-old develop his fine motor skills in toddlers as he stacks and builds. The design of these blocks has your little guy’s fingers and hands in mind. In this set, you will receive a total of fifty-six pieces including different shapes like triangles and quadrangles. You will also receive one booklet and one storage bag for quick clean-up and transport. If you are looking for a toy set that is great for travel, you have found it! 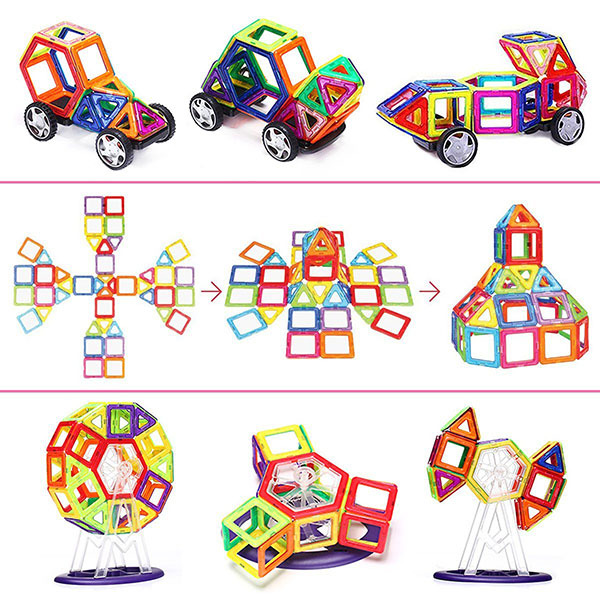 Whether you are flying or driving, you will want to bring along this building set to keep your kids busy. It will make the time go faster for you three-year-old and the trip much for fun! This toy set will provide great fun in a not techy way. If you are looking to encourage music in your three-year-old’s play time, this is a great set to consider. Included in the carrying bag is the twelve in one musical instrument set. 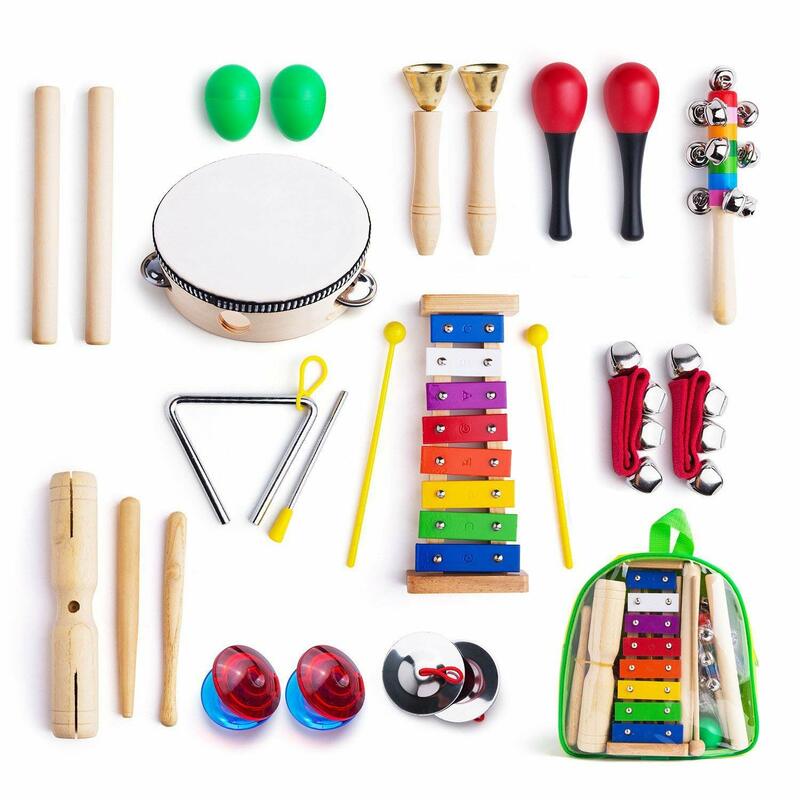 Your little one will receive a Xylophone, Maracas, a Wood Sounder, a Tambourine, a Wrist Bell, a Hand Bell, a Bell Stick, Egg Shakers, a Triangle, Finger Constanets, Mini Symbals, and Claves. This is designed with toddlers in mind and a great way to teach rhythm through play. The instruments are accurately tuned with a variety of beautiful sounds. The vivid color codes make it easier for your child to learn the tunes as well as play with the coordination. The carrying bag makes this set portable and easier for cleanup and storage. Your little one can create their own music and entertain the whole family. This is a great gift selection to encourage musical education for your young child. Your little one will get many years of use out of this set as he grows to love music and learn more about creating music. This set is a great way to develop a love for music in his early years. For some reason, toddlers and young children love to play in a closed space like a tent. This collapsible tent that is designed to look like a fire truck fits the bill perfectly. Because it looks like a firetruck it will be great for your three-year-old’s imagination as he plays pretend as a firefighter. One of the major pros with this purchase is that there is practically no set-up required as it easily pops up and folds for quick play and quick clean up. There are two door entrances on the tent. One is on the top and the other flap is on the back of the tent. One of the best features is the size. The entire tent measures 45″X 28″X 28”. 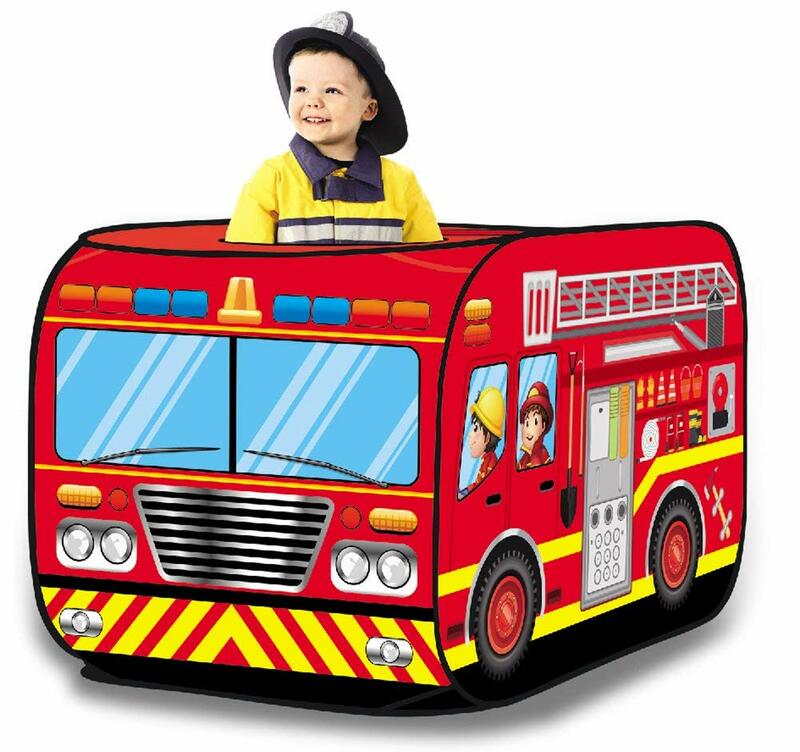 In this large fire engine play tent, you can fit up to four children at one time for lots of group fun. Also, it is designed for your little one to play inside and outside. This fun and fantastic fire truck pop-up tent provides your junior fire rescuer unlimited playtime fun. This play tent is easy to clean, durable, and strong. It is easy to store as when folded down it is only one inch when flat. Your child can get creative and bring in his favorite toys or boys. You could throw in some plastic balls and make it into a ball pit. It is also loads of fun for hide and seek. Many memories can be made in this fun pop-up firetruck tent. Perhaps you are looking for a gift with significant meaning. This book will fit the bill perfectly. 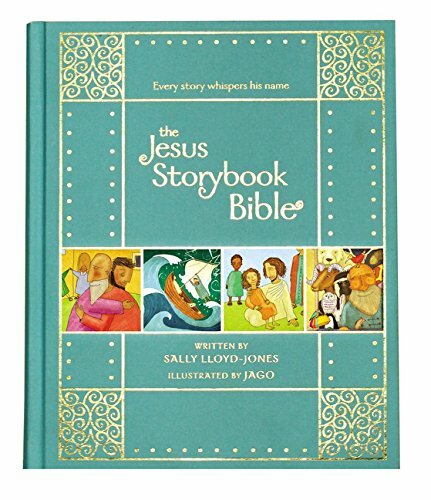 The bestselling The Jesus Storybook Bible is written by Sally Lloyd-Jones and illustrated by Jago. This special edition is the beautiful clothbound gift edition that includes a ribbon marker. Each story within The Jesus Storybook Bible tells a story of the Bible. From creation to Noah to Moses to the great King David, every story is written to point to Jesus. This storybook is a great keepsake gift to be enjoyed by young toddlers, children, and adults alike. A children’s Bible like no other, The Jesus Storybook Bible is full of adventure and allows your three-year-old and big kids, to discover for themselves that Jesus is at the center of not only God’s great story of salvation but also at the center of their story as well. You will not be disappointed by this purchase for your family! If you are looking for something to help burn off all that big toddler energy, this is it! The hover soccer ball floats on the air produced by a fan and an included rotary motor. This is a great year-round activity as it works great indoor or outside in the yard. While inside, the cushion disc does not have sharp edges which means your furniture and walls are protected from damage. In fact, the ball will bounce away if there is a crash. 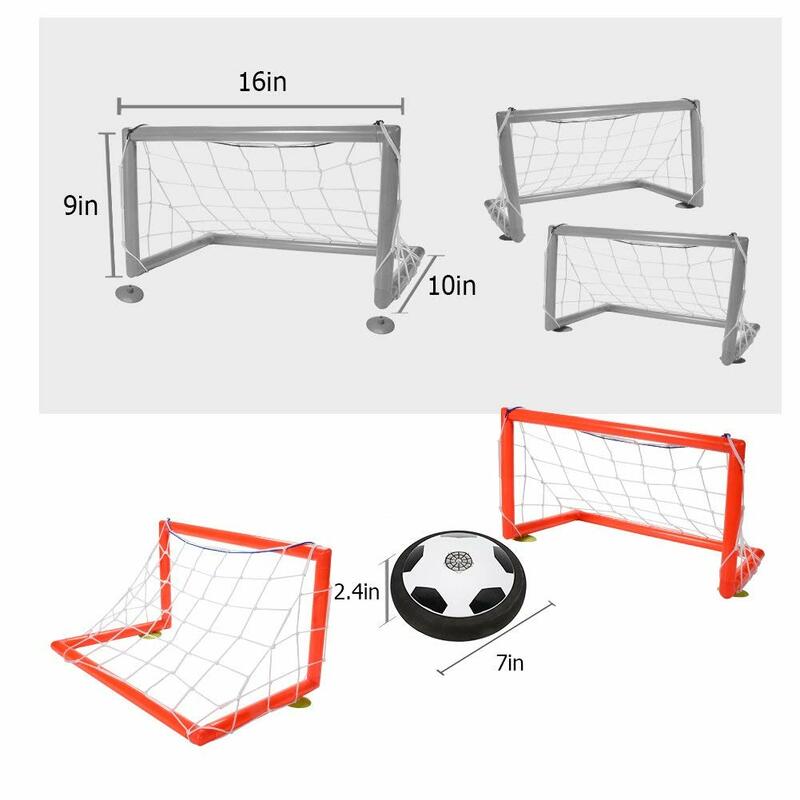 The foam edging of the soccer glider is flexible and safe so as not to hurt your child’s foot. This really fun activity will encourage motor skills, coordination, cooperative play, and social skills. It requires lots of moving and loads of running around which is perfect for this age! Your three-year-old will likely grow in motor and coordination skills as he imagines working in construction. This set is comprehensive with an all-inclusive toolset with twelve different life-like tools. Parents rave about this set being so real and quality made. Many of these toy tools actually work while being age-appropriate and safe for your little builder. 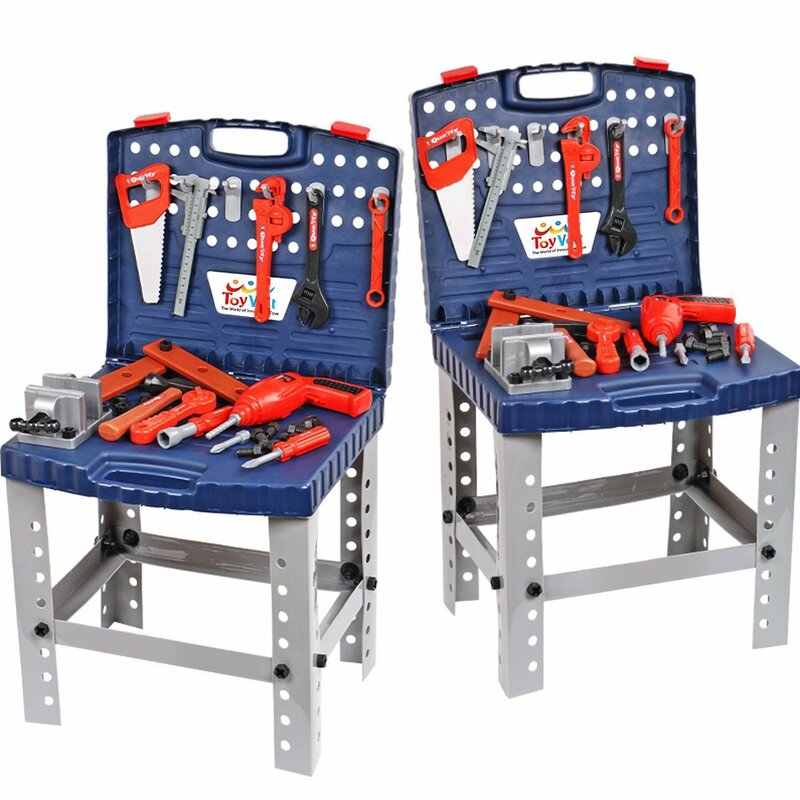 With your purchase, you get a lot for the price point including a tool bench. Your little guy can pretend to fix things all around the house with each of his tools. My son loves to pretend. He asks me to call him and give him a list of things to repair. He then takes his tools from room to room and “fixes” them for me. It is so cute to watch his little mind grow as he plays for hours with his “grownup” tools. Your three-year-old will get many years of play out of this fun life-like toolset! As you select the perfect gift for the awesome three-year-old boy in your life, I hope that something from our list catches your eye. We have covered everything including musical toys, sports, and active toys, building toys, and drawing toys. Each of these toys is three-year-old approved and age appropriate. While having fun, your little guy can enjoy learning, growing, and playing by receiving one of the best gifts for three-year-old boys!